Hemavan Tärnaby is northern Sweden’s biggest ski resort and offers exceptional skiing in breathtaking mountain setting. Hemavan and Tärnaby are two resorts in Swedish Lapland which offers skiing for all levels. The distance between Hemavan and Tärnaby is 18 km and the easiest way to travel between the resorts is by car or taxi. Hemavan ski area has 9 lifts one of which is a gondola/ telemix lift , 30 slopes, 3 children areas, 2 snowparks and a Skicross-arena. Hemavan is also known as a free skiing paradise where Kobåset is considered by many as Sweden´s best freeride area. Tärnaby ski area has 5 lifts and 15 slopes, including celebrities such as Ingemarbacken and Anjabacken. There are also 2 children areas, 1 retropark and large free ride areas. Fly from Stockholm, Arlanda to Hemavan and land in the middle of mountain adventure! 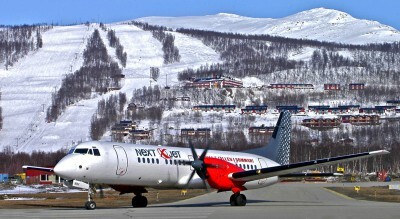 Hemavan is unique when it is the only ski resort in Sweden who has an airport in the middle of the village, only a few minutes walk from the ski slopes and accomodations. From Stockholm, Arlanda it takes about 2 hours and you can choose which day you want to go since there is departures six days a week. In the winter we offer unbelievably low prices to everyone who wants to take the flight to Hemavan. Here you can read more and book our flight offering. The ski resorts of Hemavan and Tärnaby bring skiers, snowboarders and snowmobile enthusiasts from near and far, eager to experience the winter thrills and excitement they offer: alpine and cross-country skiing, heli-skiiing, snowmobile tours and ice fishing. But the lure of the mountains is year round. The long glorious days of summer see outdoor adventurers drawn to this magnificent unspoilt landscape to get their fill of trekking, fishing, cycling and pot-holing, alongside those who move at a more leisurely pace and just wish to bask in all that Mother Nature has to offer. Situated within the county district of Västerbotten and province of Lapland, Hemavan and Tärnaby are where you can find one of the world’s most successful ski sports clubs, Tärna IK Fjällvinden. Unsurprisingly then, they’re also renowned for producing a host of successful alpine skiers: Anja Pärson, Jens Byggmark, Stig Strand and Ingemar Stenmark. For nature lovers, Hemavan Tärnaby couldn’t be better placed as it is located right on the doorstep of the Vindelfjällen Nature Reserve, Europe’s largest pristine wilderness. Covering a vast 550 000 hectares, this spectacular region is home to a wide variety of fauna and flora and the place where two Sami communities graze their reindeer herds during the summer. Trekkers take note – Hemavan is the starting point for the king of all routes, Kungsleden (The Royal Trail). This leads to Abisko, 450 km and many, many, many steps north. Despite their large-scale natural surroundings, the villages and facilities of Hemavan and Tärnaby remain small and intimate. There are no huge ski-lifts or mega-hotels to be found, yet you will find that personal service and quality are prized far more here than at many other mountain resorts. It is probably why visitors keep returning year after year. At 1,000 km north of Stockholm, you might think the area is remote – far from it. Flights six days a week from Hemavan Tärnaby airport maintain close links with the capital as does the long distance coach service which has several departures a week. There’s also a night train that connects Stockholm to Vännäs from where travellers can board a bus to continue their journey up country. The university town of Umeå has a daily bus service too, particularly popular with those who have arrived on the daily ferry from Vasa, in Finland, run by Wasaline. Hemavan is a growing village with a large variety of restaurants, shops and entertainment at the same time as the village exudes a genuine sense where the bustle of the city seems so far away. After a long day on the slopes , you can unwind with a cup of coffee in one of the village’s restaurants or why not relax with a sauna or bath in a hot tub with magnificent views of the mountains . For those who prefer to raise the tempo after a day of skiing can choose from a busy after ski at Hemavan Högfjällshotell , a beautiful troubadour evening at the bar En Trappa Upp or why not end the evening with clearing the nightclub Lappkastet. More information about our restaurants and entertainment can be found here . Tärnaby – the small village with a big heart. Enjoy alpine skiing whether you’re a fan of off piste and steep slopes or rather prefer the chairlift and a lunch on the patio. Snowmobiling, crosscountry-skiing both on the lake and in the forest and of course a variety of restaurants to choose from is available for all. Tärnaby is family friendly and off the beaten path when it comes to night clubs and city lights. But we recommend that you enjoy our after ski, a three course meal at Tärnaby Fjällhotell or a Swedish ‘fika’ at the Café Familjen, the coffee shop that the White Guide recommends.